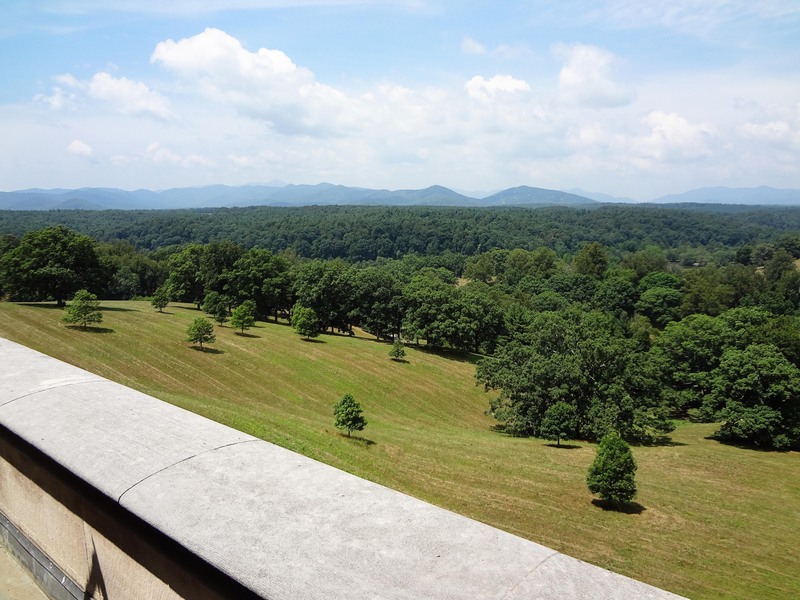 It is official: my wife and I want to retire in Asheville, North Carolina. 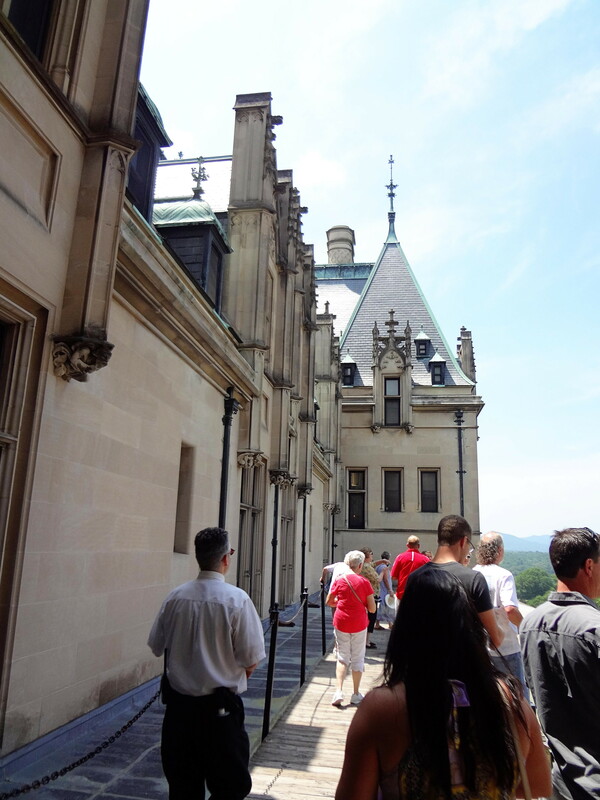 Our six-day visit there was exceptional; a wonderful mix of nature, food (and craft beer) and visiting sites like the Biltmore Estate. 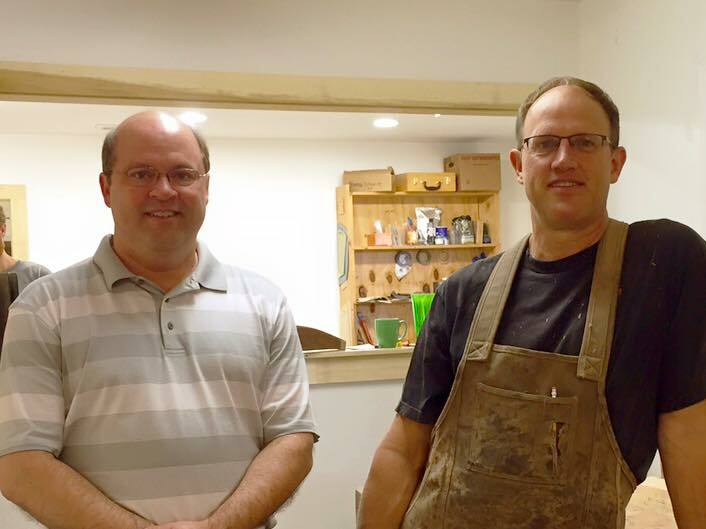 I also explored woodworking: I met with two nationally known woodworkers as well as visited craft fairs which featured extremely well designed and executed furniture as well as boxes, bowls, spoons, etc. And we did not get everything accomplished while we were there, so we’ll be back. 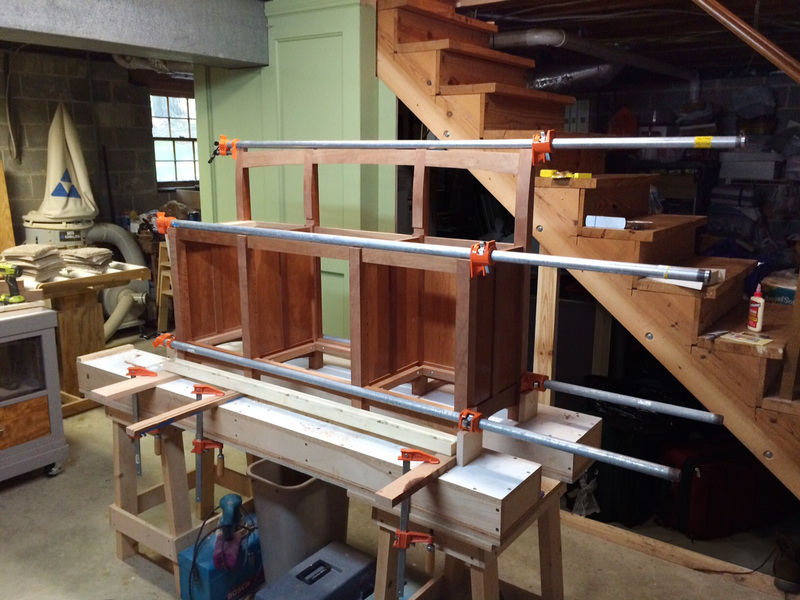 You will remember from my last post that I had the left side glued-up and the right side glue-up was about to begin. 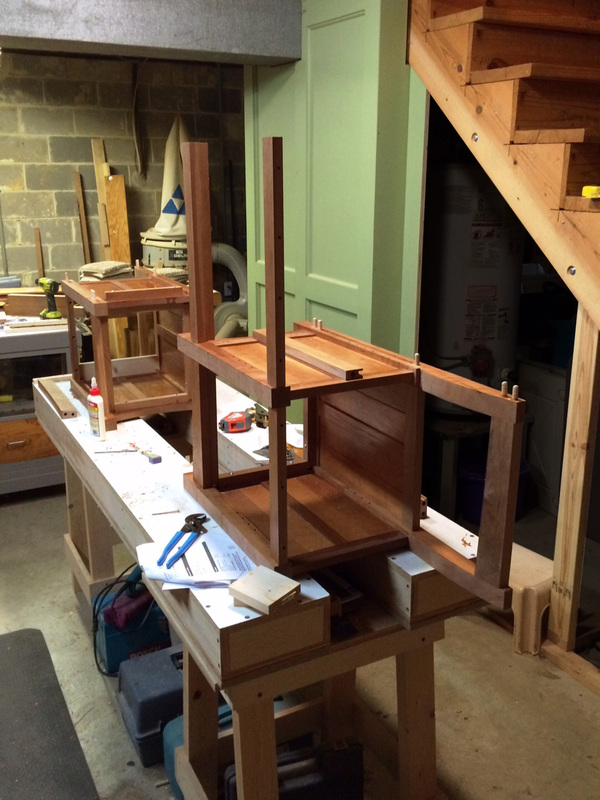 As you can see above, the right side glue-up is complete and I am starting to position the middle aprons in an effort to bring the left and right sections into one bench style bookcase. The glue-up bringing the left and right sections together. 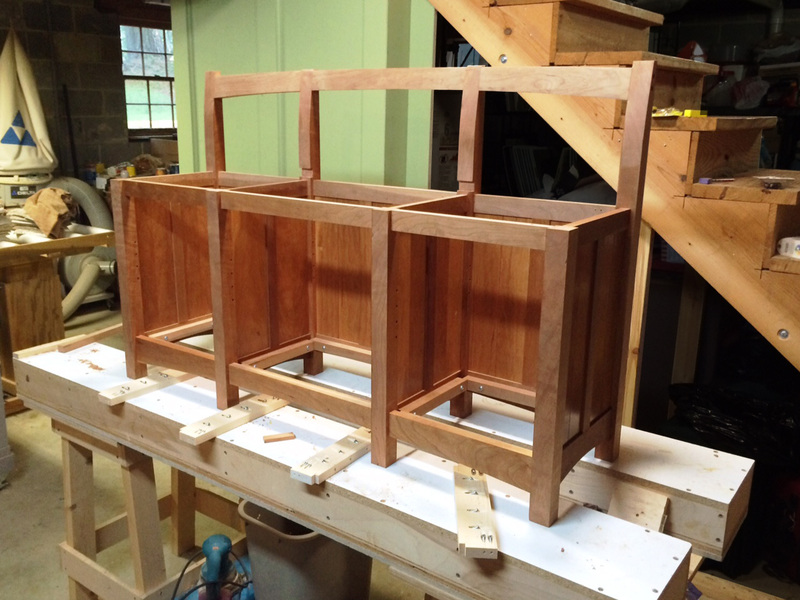 The bookcase seat, which fit fine prior to glue up, now does not fit. At least it is a little too long. It won’t fit between the outer legs like it should. A little trimming with a chisel will fix that. 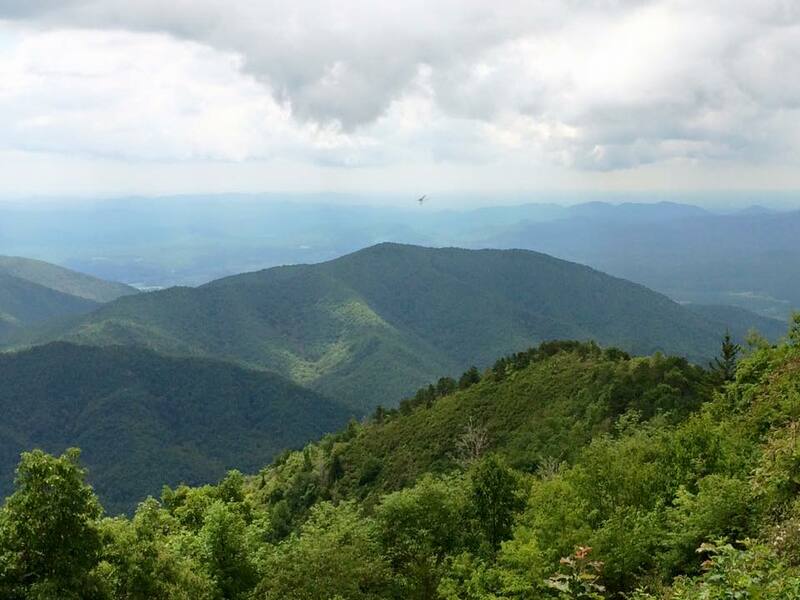 SECOND, THE VACATION – anyone who is in a remotely reasonable driving distance to Asheville, North Carolina, and has never been there; just stop what you are doing and start making plans. Growing up, the big summer vacation was always at the beach; one of these three locations: Gulf Shores, Alabama, Destin, Florida, or Panama City Beach, Florida. 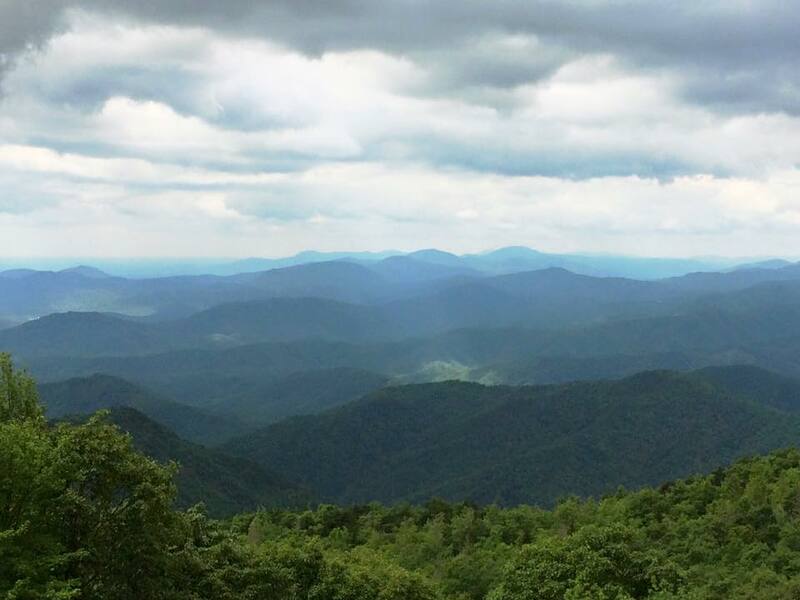 We still love the beach, but the North Carolina mountains are such a polar opposite, we now call this area our favorite vacation spot. What is around the bend? Difficult driving! At Craggy Gardens welcome center. Note the stiff wind blowing the trees. 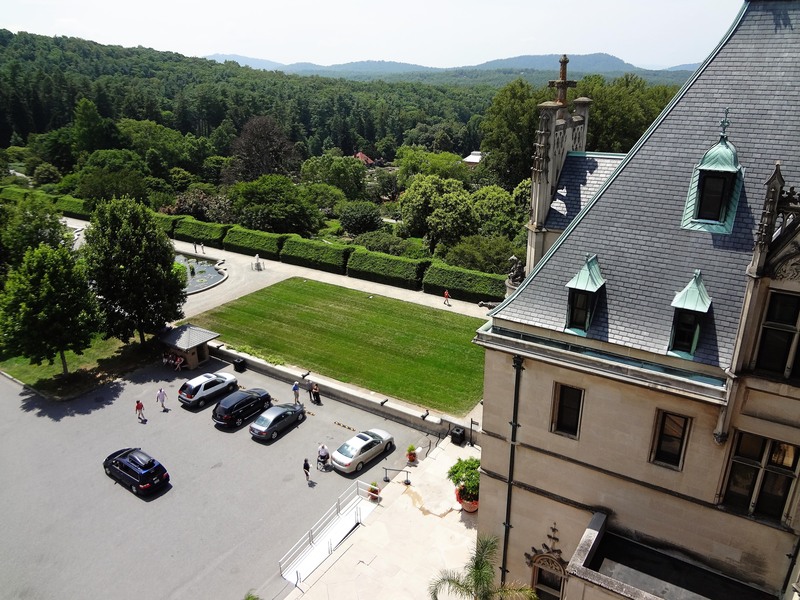 My second trip to George Vanderbilt’s home and still inspiring. 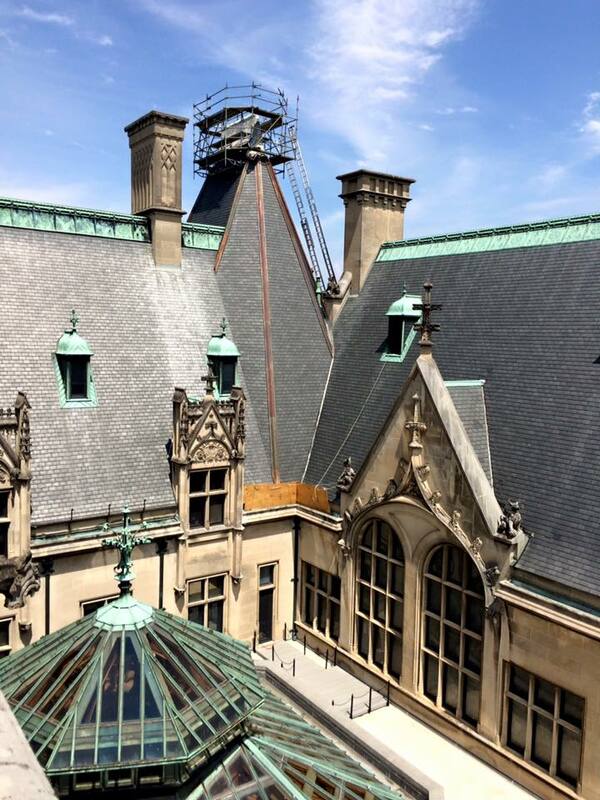 We took the roof top tour – a first for us. 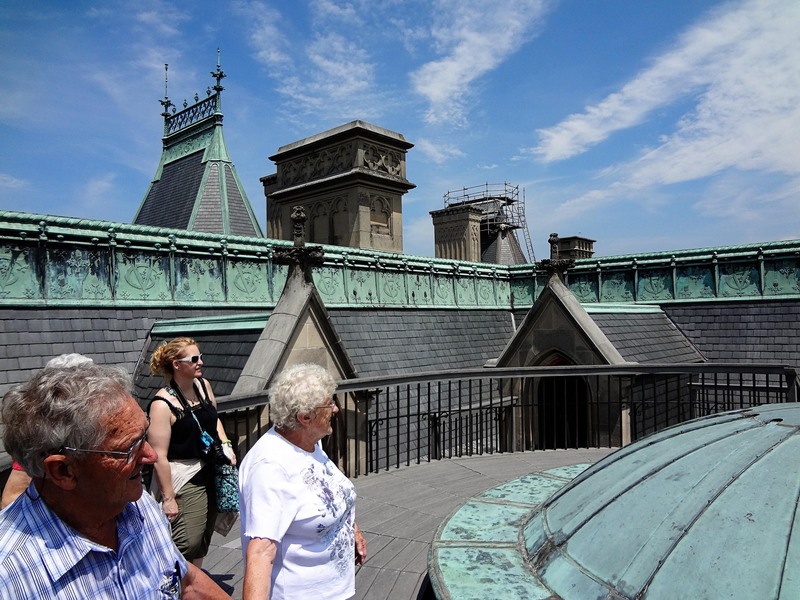 We have been on the standard house tour before and we did that this time too, but the roof toor was something I always wanted to take. 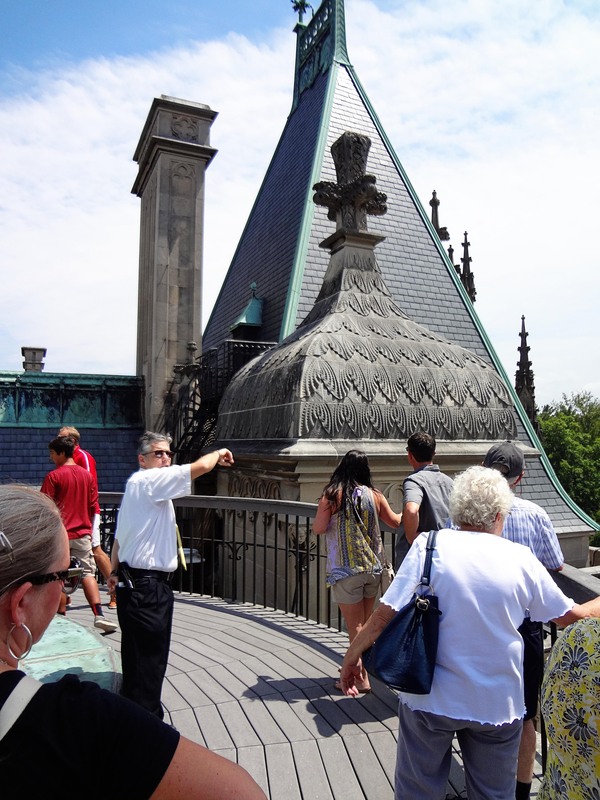 The roof tour had us walking along a narrow path around the roof of the main entrance of the home. 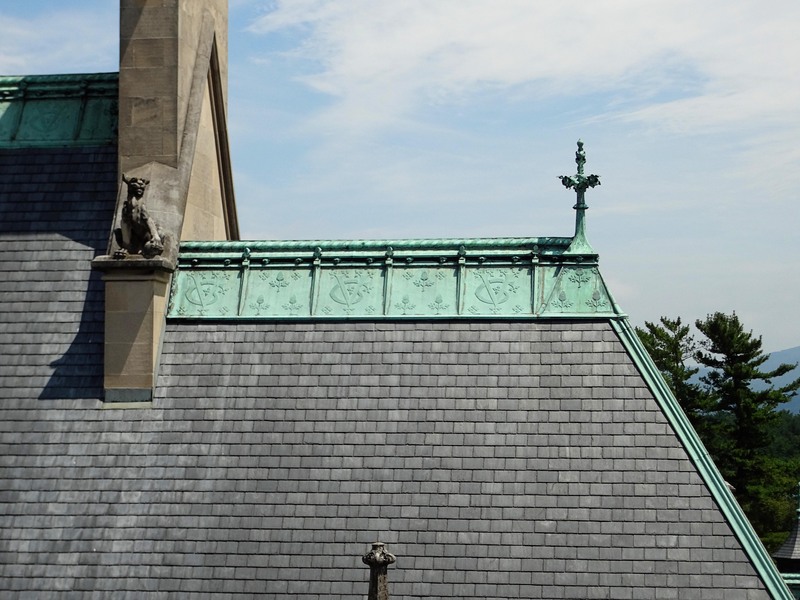 The copper has George Vanderbilt’s initials engraved in every other panel. These were once decorated with gold leaf; now worn away. 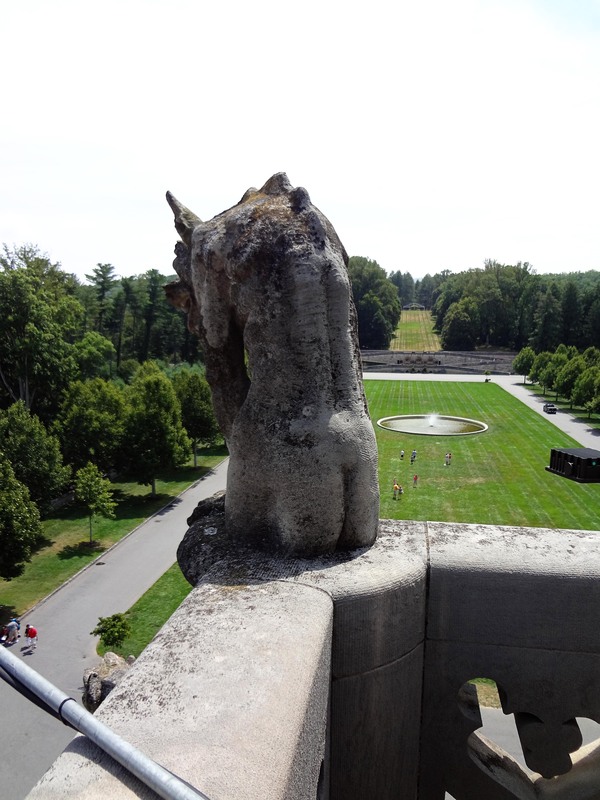 Note the care taken to shape this gargoyle’s rear end. Lots of copper. Just imagine how much maintenience costs! Our tour guide motioning us to the rear of the building. The rear of the home, walking above the loggia. 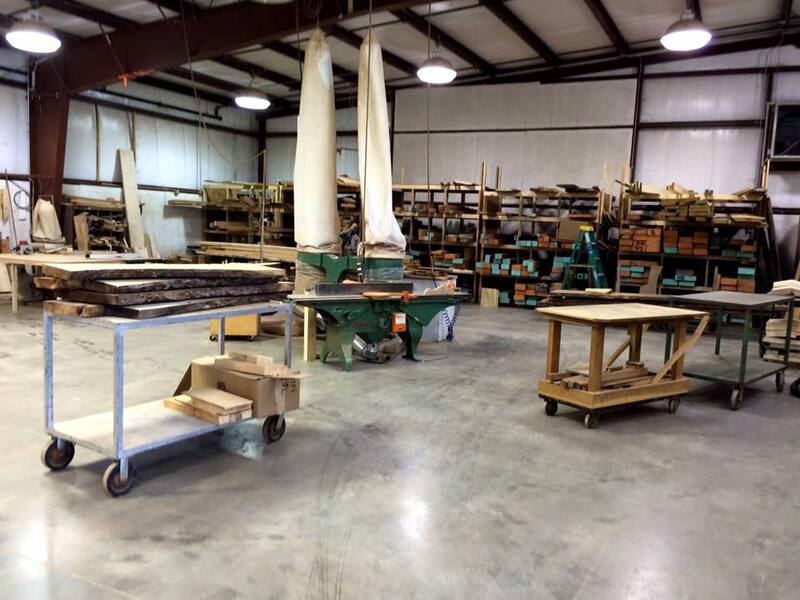 VISITING NATIONALLY KNOWN WOODWORKERS – While in Asheville, a goal of mine was to take in the local woodworking community which is extensive. I spent almost four hours with hand plane maker Scott Meek. I took a class from Scott getting one-on-one training on sharpening plane blades. We went to lunch at a local BBQ joint. We discussed how he got started in woodworking, his upcoming presentation at Woodworking in America and the status of his plane making business which is going well. He had so many orders that he was having a hard time staying organized. 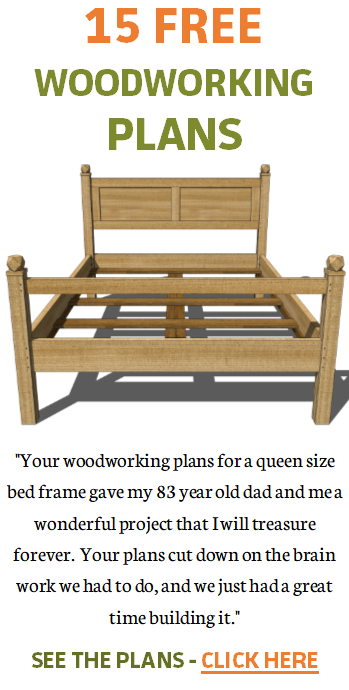 One plane order was from a woodworker in Europe. 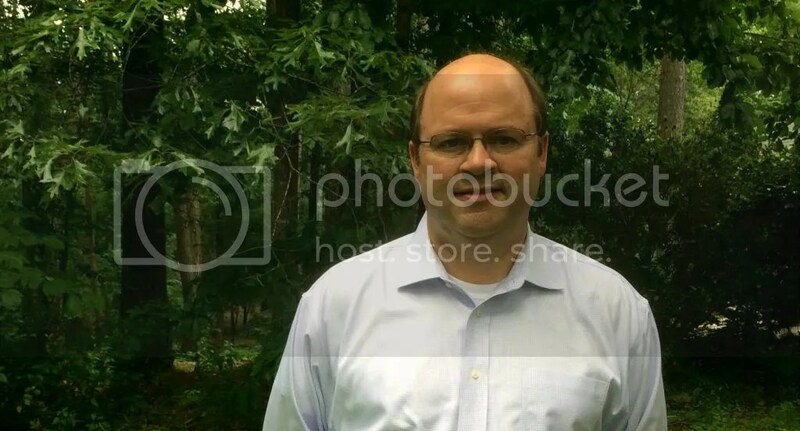 I took two photos; both of which were blurry. Dang it! 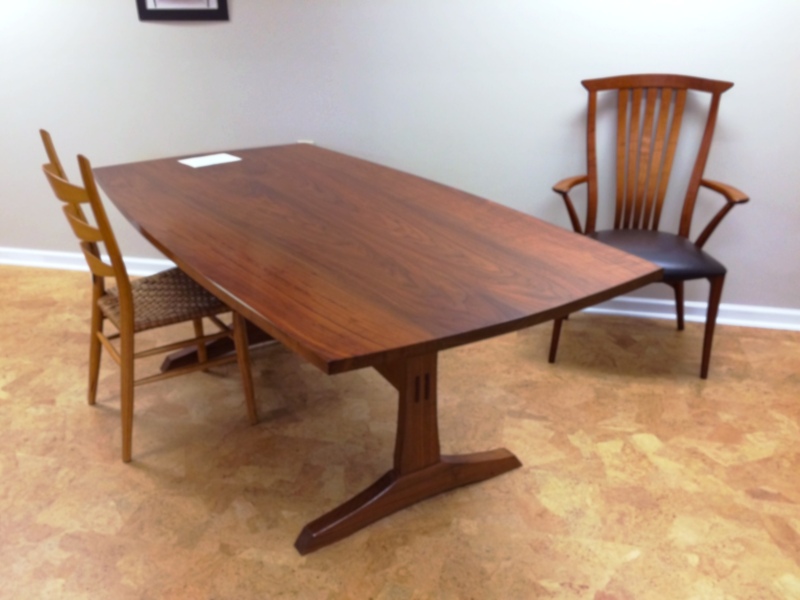 In the Bogg’s showroom: table and chairs with a modern flair. When I first called his shop, I was told that Brian was out, but to come on over and someone would show me around. While walking through the workshop, I struck up a conversation with a guy there. We talked at some length about bandsaws – how mine isn’t adjusted correctly; what bandsaw would he recommend, etc (his recommendation: nothing new except possibly a Laguna; he liked old bandsaws). This man had a dust mask on the whole time we talked. Finally I introduced myself and he was none other than Brian Boggs. With the dust mask on and my limited knowledge of what he looked like meant that I did not even recognize him. Lots of fun while in Brian’s shop and with Scott Meek. It made our trip to Asheville even more special. You just made me very happy! Now we just have to figure out if we can ever retire! Nothing I’d like better than work this out! I love that area and me and the wife talk about moving there all the time! it is either there out Santa fe. 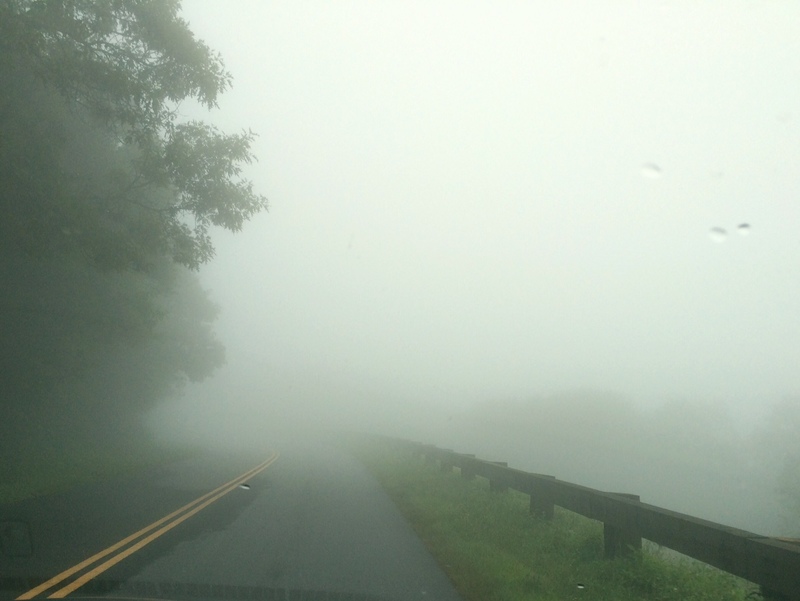 John, a relative of ours bragged today about the weather where she lives – Banner Elk, NC, near Asheville. In Birmingham, Alabama it was 101 degrees today. In Banner Elk, about 75 degrees. Beautiful weather and so much nature and woodworking. A sweet place to live! I’m glad you guys had tons of fun in Asheville!! Glad you had a great trip. I always say “live where you want – what you want to call home – and work only where you HAVE to”. David, that is a good philosophy. 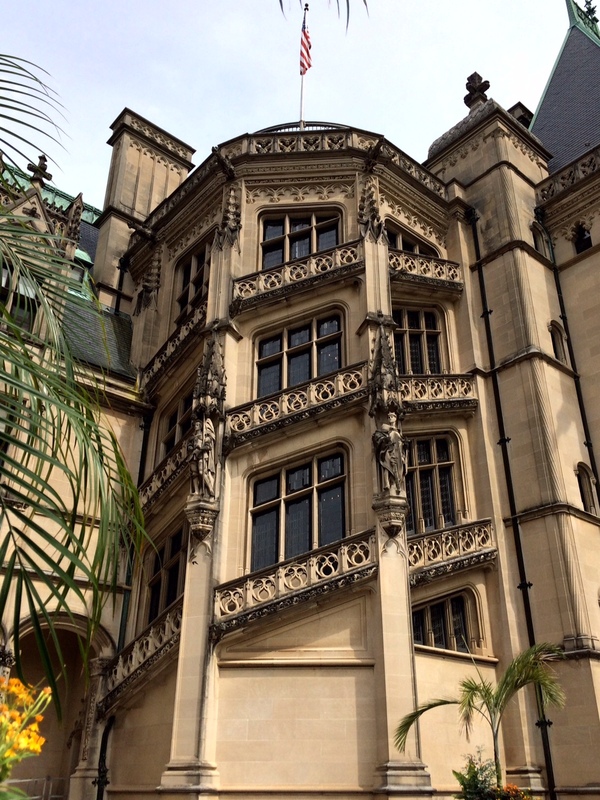 The only problem with Asheville is the cost of housing there. Pretty steep. But, I know there is a place for us there somewhere. Where there is a will, there is a way. I wish you the best in that endeavor…. That woodwork is SO great! Also, those pictures and views look amazing, good pictures! 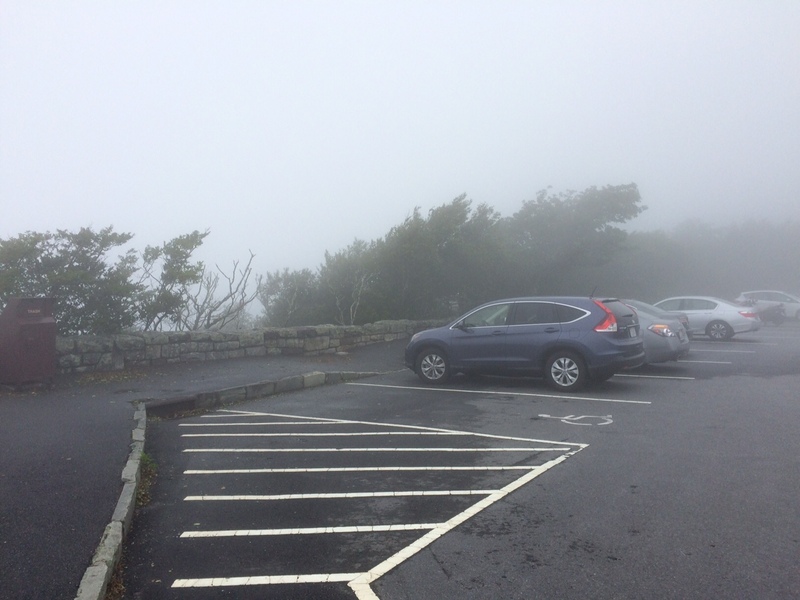 That wind blowing the trees at Craggy Gardens… pure madness! Great post! Few things are better than cobining a holiday trip with the work you feel passionate about. Regards from Argentina! 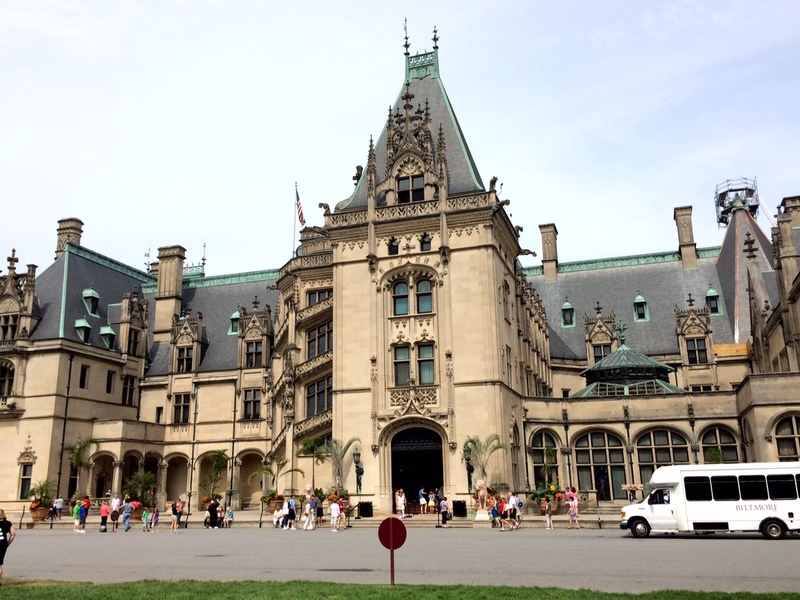 Great trip, you will love Asheville! 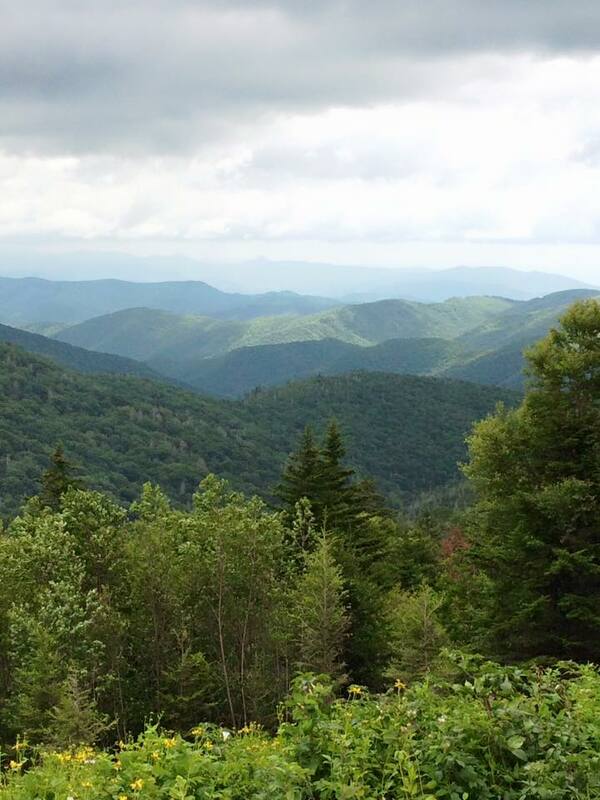 I live only 45 minutes from Asheville on the side of a mountain and we love it here. We are still talking about how much we like Asheville. Hopefully everything will work out for us to retire there. You made a good decision to retire to Asheville. My shop is 35 miles east in Marion, NC Glennwood Community.